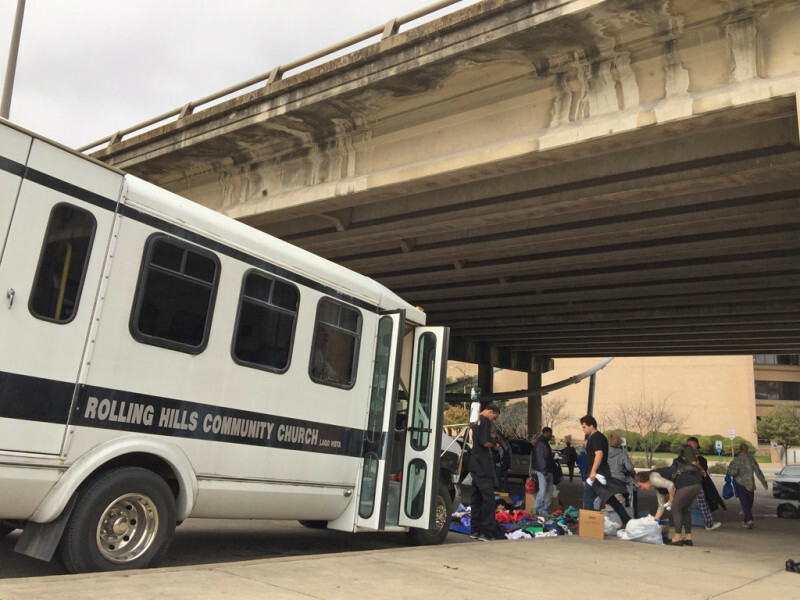 Church Under the Bridge is one of several missions by Mission Possible Austin in East Austin. 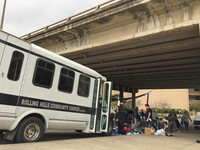 Every Sunday, rain or shine, hot or cold, they set up in a city parking lot under the I-35 overpass bridge in downtown Austin between 7th & 8th Streets. Other cities also have a similar Church Under the Bridge program, Waco being one. About 200+ street people show up. (It is estimated there are about 6,000 homeless people in Austin.) Various churches bring food on a rotating basis. RHCC financially supports Mission Possible Austin and takes used clothing and toiletries several times a year. How often does RHCC go to the bridge? There is no regular schedule. We go when enough donated clothing comes in to make the 36 mile trip worthwhile. We typically leave about 8 am Sunday morning from the Fellowship Hall parking lot in the church van and return before noon. Trips are announced a week or two in advance in the church newsletter. Everyone is welcome to come and see what goes on under the bridge. Help sort bags of clothing and prepare it for loading on the church van. It takes 5-7 people a couple hours to sort and prepare all the items. Cash! More finances will enable us to purchase backpacks and other items that are not often donated. First, what they don’t need: Winter clothing in the summer and vice versa. because they can’t use it and we can’t store it. Please don’t bring stained or dirty clothing. Street people cannot use dress clothing or dress shoes. Men’s and Women’s Clothing: gently used and CLEAN. Shirts and pants, esp. Jeans. SMALL Bible and books, crossword and search word books, small puzzles, playing cards. Jesus went to the poor with love and healing. Following Jesus leads us to care for the poor, to share our blessings with others who need some help. How much does this really help the homeless? Our donations help a few people get along for a few days. What they really need is shelter and help to get back into society. In the meantime, at least they will know that we care and maybe sense God’s love.